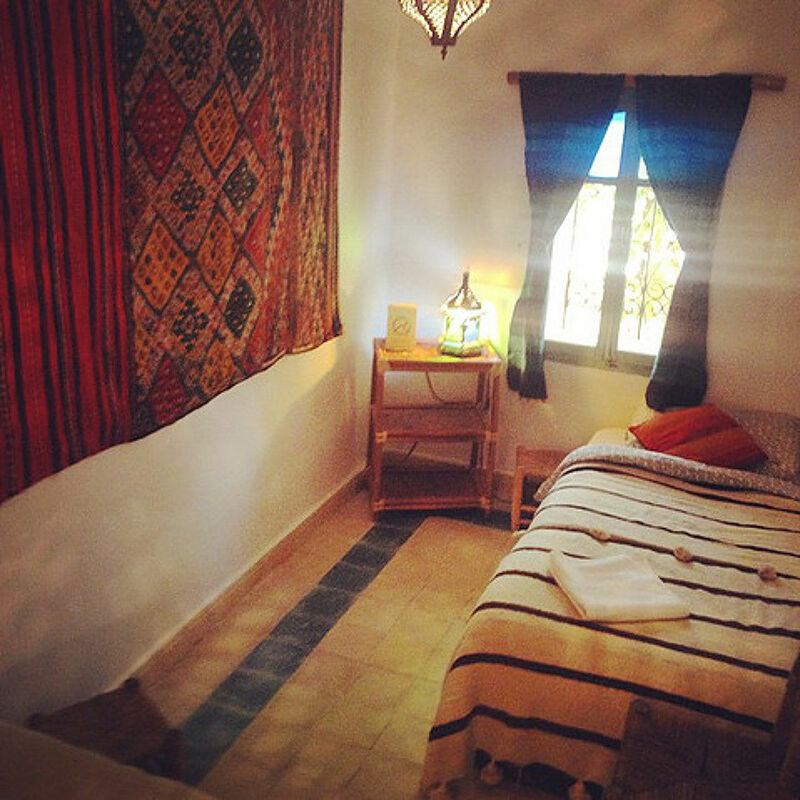 A cosy SurfCamp and Surfschool located in Tamragh, near Agadir. All our instructors are locals who know the spots like the back of their hand; they are fully qualified and will share their knowledge, expertise and especially their passion for surfing. 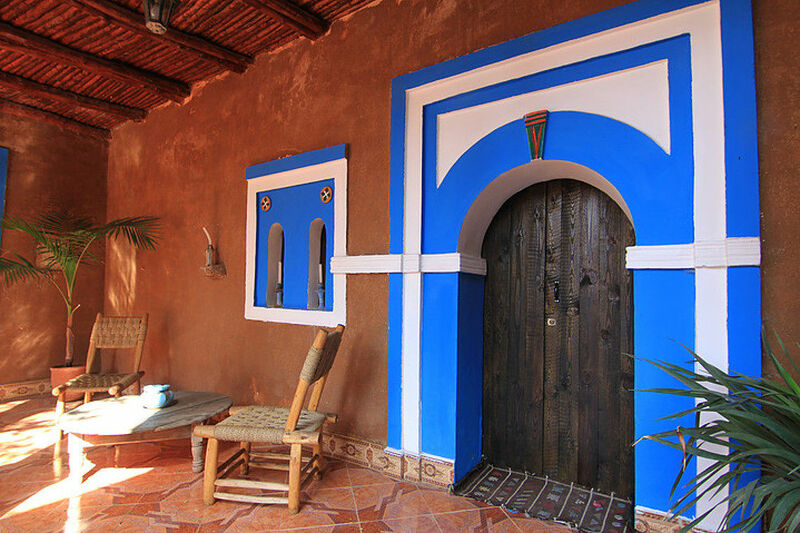 We are located in Aourir or Banana Village, an authentic Berber village, 14 km from Agadir and 50 minutes from the international airport. Sabine and her team will extend a typical warm Moroccan welcome to you and let you get some first hand experience of Moroccan culture and the Moroccan surfer lifestyle. This beautiful oasis is located about forty minutes drive from Tamraght in the Atlas Mountains . You will spend an exciting and unique day: swimming in natural pools with water slides and rock jumps then lunch in the palm grove, and for the more adventurous there are short discovery trails to explore. Enjoy our yoga sessions with professionals who know how to combine the benefits of Yoga with surfing. Facing the ocean on the terrace of the Riad you will find calm, well-being and harmony. Experience the sunset on the beach on a ride setting out from Aourir towards Taghazout ... An extraordinary and compelling experience. Experience the pleasure of a massage with Argan oil. Argan oil comes from the argan tree, found in Morocco, mainly in the southwest of Morocco, between Agadir, Essaouira and Taroudant. It is widely used in traditional cooking but it is also used for its beneficial cosmetic properties, as it is rich in vitamin E and antioxidants. 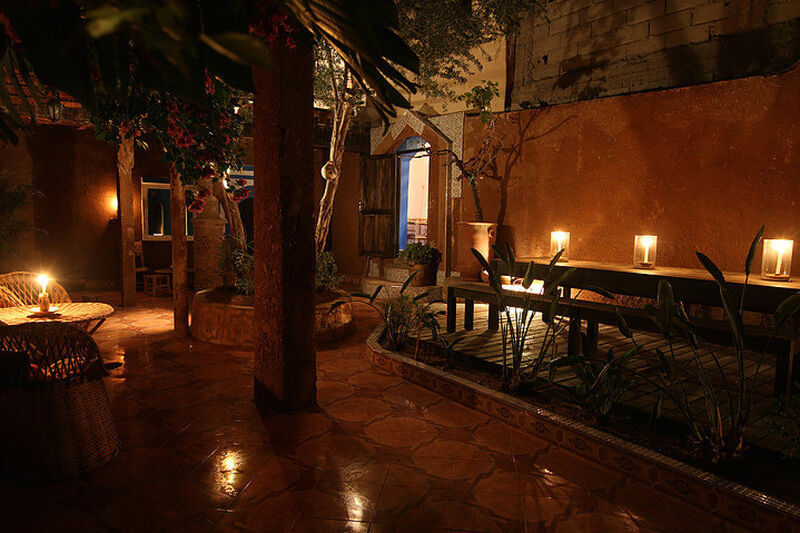 Traditional Moroccan Hammam : This oriental ritual that originates from Roman times is a staple in the lives of Moroccans. The baths are both a social meeting place and a place to relax, enriching both the mind and body: this is an experience you should not miss while you are in Morocco. The hot steam dilates blood vessels and helps the body to relax. Rough skin floats away, toxins are eliminated, muscle pain alleviated and your stress released! Perfect after a day of surfing ! - The local Agadir, Aourir, Taghazout and Anza souks. - Essaouira Medina: formerly known as Mogador (from the Phoenician word Migdol which means "small fortres "), it is an outstanding example of an eighteenth century fortified city, surrounded by Vauban style walls and a UNESCO World Heritage Site. - Marrakech: at the foot of the Atlas Mountains, home to impressive architectural masterpieces and Moroccan art (ramparts, monumental gates, the Koutoubia Mosque, Saadian tombs, Badiâ palace ruins, Bahia Palace, Menara pond and pavilion) each one an outstanding example of Moroccan heritage in itself, that can all be visited in a day. Magic Surf Morocco is located in the authentic Berber fishing village of Aourir (Banana Village) at just 5 km from Taghazout, 1 km from Tamraght and 14 km from Agadir and 40 km from its international airport. It is a quiet retreat, an oasis, far away from the cities hustle and bustle where you can treat yourselves to a relaxing, healthy but yet sporty holiday: surfing, yoga, sunbathing by the pool, learn how to cook traditional Moroccan dishes such as tajine, rfissa, couscous, enjoy traditional Moroccan hammam, argan oil massage, and much more, and wake up every day seeing your stress just flowing away! Villa Shangri-La, Surf & Yoga, is a stunning, recently built, 3 stories villa with 6 bedrooms fully equipped for your comfort: private shower and toilets (either inside or just outside the bedroom), bed linens, bath towels, air conditioning, heating and garden / swimming pool / mountain views from each room. From the rooftop terrace, you'll enjoy both amazing Moroccan countryside and ocean views. There are small lounges on each floor with sofas and balconies. On the ground floor, the communal eating and chilling out area opens onto the swimming pool and the garden. All meals at the villa are included in our various packages and the morning and evening meals are served round the pool in a chilled and relaxed Moroccan atmosphere. Breakfasts include hot drinks, fresh orange juice, fresh fruits, cereals, yogurts, etc. All you need to kick off a great day’s surfing! We also provide picnic lunches that will be taken on the beach between the surf sessions and healthy and delicious home cooked dinners. SURF SCHOOL Magic Surf Morocco is a Surf Camp but also a surf school offering surf lessons, guiding and equipment hire. If you already have accommodation but want to learn to surf, improve or explore Morocco’s best spots with a guide / instructor, we have everything you need. For the rates, please click on the tab "prices"
7 Breakfasts with hot drinks, fresh orange juice, fresh fruits, cereals, yogurts, etc. all you need to kick off a great day’s surfing! Contact us for a personalized quote for all group requests: family, friends, and team building, special occasions; a full week, a weekend – we can make it happen!! We will work with you to tailor your trip with a mix of varied activities: surfing, relaxing on the beach, well-being, sightseeing…. Our local guides and instructors will make sure it is a trip to remember. -Agadir : Large sandy bay where some beachbreak peaks unroll and have a tendency to close up to 1.20m. Walking South towards Oued Massa’s river mouth, close to the Presidential Palace, some quality peaks. An alternative when the coast saturates. -Bo & Co 2 : Beachbreak that can prove fantastic (it depends of the sand-bank). A fairway takes you to the spot without paddling and without the wave crashing above your head. It starts in a powerful basin offering you a very tight tubular right and/or a left that has a propensity for turning around itself even with a very hollow section. This spot works from 30cm to 2m, 2.50m max and need little swell on the usual spots, very sensitive to the wind. For every surfer. -Bo & Co 3 : Very good-quality right and left on flat stones that can end up under the sand according to the time. The environment is gorgeous, needs a little swell on the usual spot. For intermediate surfers. -The 11 and the 12 : very nice lefts, tubular during the first section on a rocky flat stone, reef wave feeling when take-off – to surf especially in low, rising tide. -Banana : Long right coming from a cliff and ending up on a pebble or sand beach. This low tide wave can be extraordinary, turning into a nice right left peak and sheltered from the Northern wind in the rising tide. -Devil's Rock : Small beach isolated between two rock advances. Beachbreak that can almost always be surfed with some very good-quality waves sometimes. -Mysteries – La Source : Risky right according to the sand silt up, starting from a rock vein. Although it can be awesome, the surfers often sulk it. A great opportunity for a quiet surfing session between friends. - the first one, the farther is a large basin- the middle one, much longer than the 1st one is composed of lots of quick sections- the inside, long and hollow, is smaller and steadier. -Bo & Co 1 : Very pretty spot with rocky flat stones in front of a little cliff, in a gorgeous and deserted place. A good swell is necessary to work, you can also surf at La Pointe and Killer to surf peacefully, the spot is working from 1m without a size limit. -Bouilloire : also known for its sea-urchins, this is a spot that well-receive the swell. Offshore wind, sideshore by a Northern wind, a very good right on the flat stone of the rock. Not many waves, very quickly crowded and can be surfed from low to half-tide. Not easy launching and coming out of the water for those who are not used to rocks, boots are recommended. Reachable for regular level surfing. -Dracula : Impressive place, incredible right, probably the most powerful of all, reserved for very good surfers, can handle heavy swells, difficult launching, and uncertain coming out of the water. -Tamri : A beachbreak that takes well the swell in little condition days. The first trip! With a Renault 4L, a bicolour Super 5, a Nevada break, a Peugeot courier or an old VW Euro van…The road is going to be long, heading due South.Worry, anxious, sick of winter, dreaming about waves unrolling near Safi, la pointe des Ancres, la Banane, Bouilloires or more down South at the entrance of the desert…If you want to learn more about surfing, you need to stop there. This is the ideal excursion from October to May to get ready before the season on the French coasts. Morocco is a country bordering both seas: the Atlantic Ocean and the Mediterranean Sea.In the Centre, the Rif and Atlas Mountain chains that block the scenery. From this diversity of grounds was born a great variety of Moroccan landscapes which are among the most beautiful of the world. Transfers to and from Agadir Airport from 7-night stays. 7 breakfasts: hot drinks, pressed oranges, fresh fruit of the season, cereals, yogurt, etc . ; All you need to start a good day of surfing! Travelers are advised to carry appropriate travel insurance covering surfing and repatriation. We do not assume any responsibility for accidents and loss / damage of surfing equipment on loan. In the case of box / loss of the surfing material, it will be asked 1000 dh for a combination and 3000 dh for a foam board for example. Transfer aller / retour de l’aéroport d’Agadir pour les séjours à partir de 7 nuits. 7 petits déjeuner: boissons chaudes, oranges pressées, fruits frais de la saison, céréales, yaourts, etc; tout ce qu’il vous faut pour bien commencer une bonne journée de surf! Plan a holiday for at least 5 of your friends and you can join them FOR FREE ! Available from our 7 nights packages! 2 adults + 2 children between 7 and 18 years old, in 2 double / twin room or one quadruple room if available: 2000 € instead of 2200 €. For families with more than 2 children, please contact us for the rates. Reviews on "Magic Surf Morocco - Yoga & Surf"